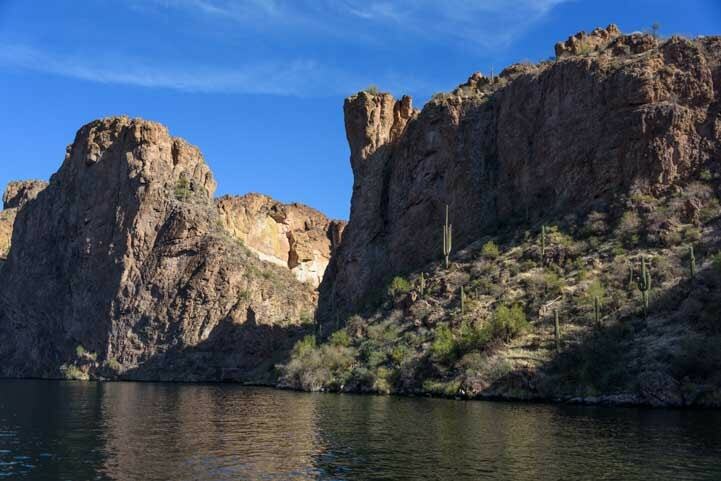 February 2018 – One of the most enjoyable ways to experience the beauty of the Sonoran Desert in Arizona is to take a boat ride on one of the lakes around Phoenix. 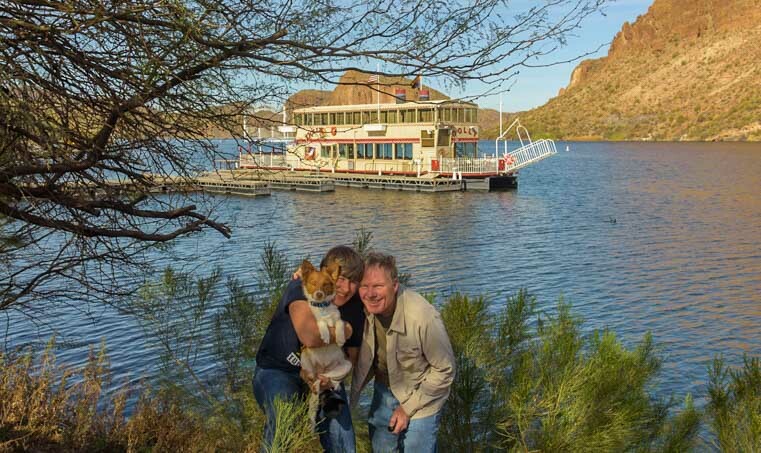 Years ago we rode on the Desert Belle on Saguaro Lake and absolutely loved it. 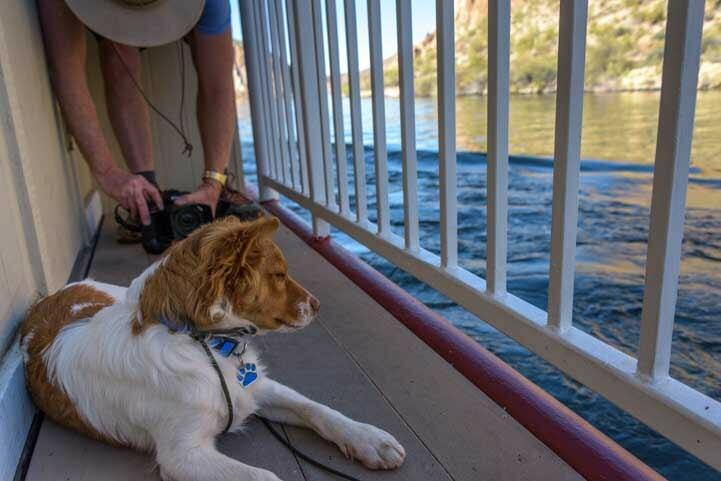 This past week we took a ride on the Dolly Steamboat on Canyon Lake. 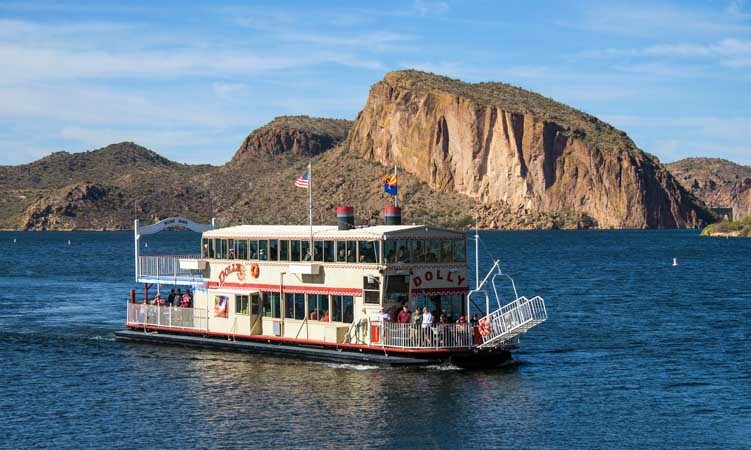 Dolly Steamboat floats through the Sonoran Desert on Canyon Lake in Arizona. 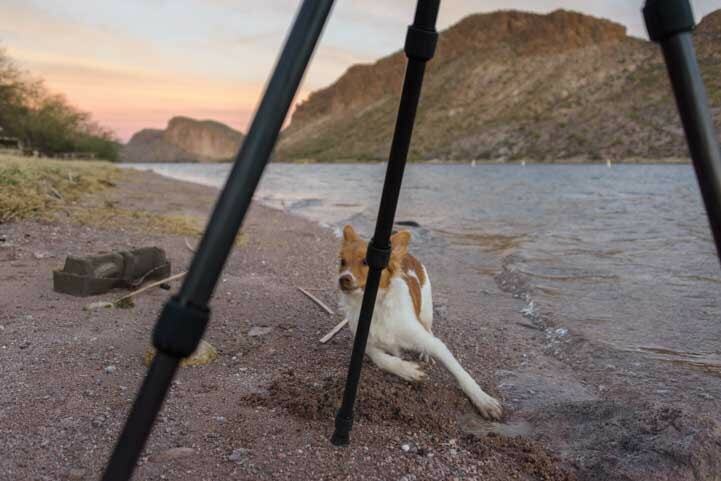 While we were camped in our RV on Canyon Lake, our new puppy Buddy loved going down on the beach, especially during our early morning photo sessions. He liked to show us how fast he could zip between the legs of our tripods. Buddy shows us his slalom skills. When he wasn’t busy doing that, he was sprinting across the lakeside lawn carrying his favorite pink rope toy. 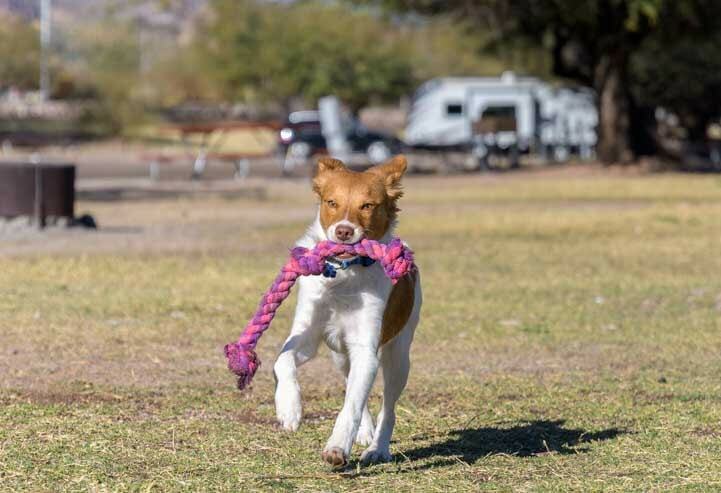 Canyon Lake Marina & Campground has a big open grassy area that’s great for playing fetch. Late one afternoon while he was down on the beach playing with the waves, he noticed an inflatable boat that had been pulled up on the beach. Hmmmm… a boat ride might be pretty fun! A little sailor dog is born. 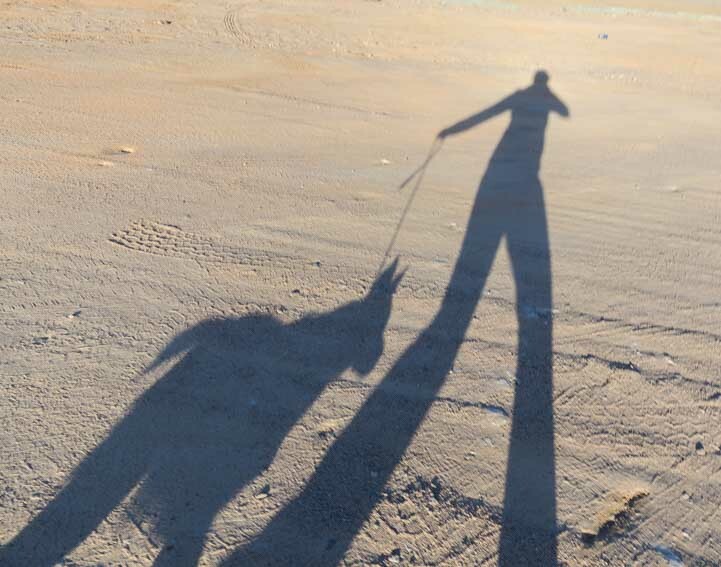 While we were out walking the next morning I was busy snapping pics of our shadows on the ground when we looked up and noticed the Dolly Steamboat moored at the dock. 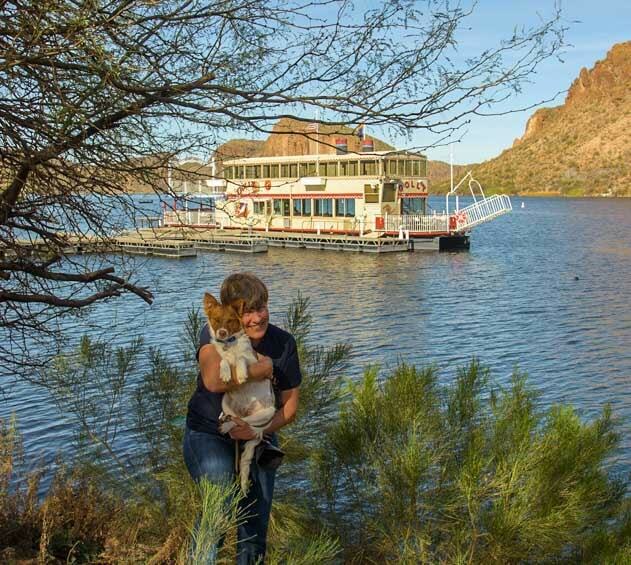 The Dolly Steamboat was patiently waiting to take her first group of passengers out for a nature tour on Canyon Lake. Dolly Steamboat rests at dawn. A steamboat ride definitely seemed like it would be a lot of fun to do together. 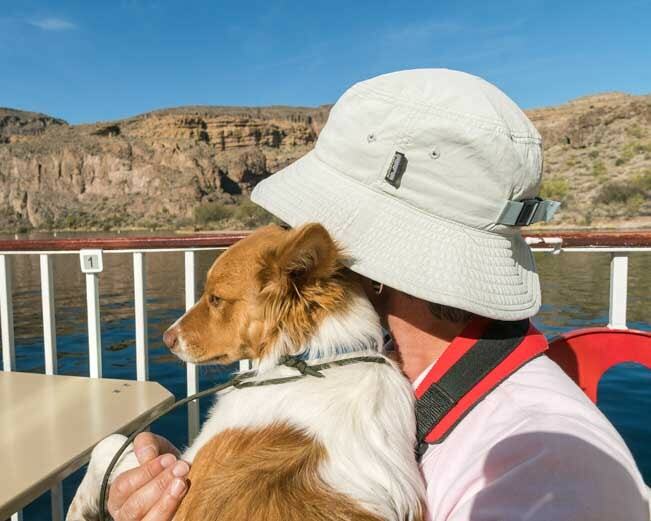 What would the pup think of a boat ride?! Canyon Lake is a beautiful big, blue lake in the middle of the desert, and we had been getting lots of photos of it from the shore as we drove up and down the Apache Trail. But seeing a lake from the shore isn’t the same as seeing it from the water. 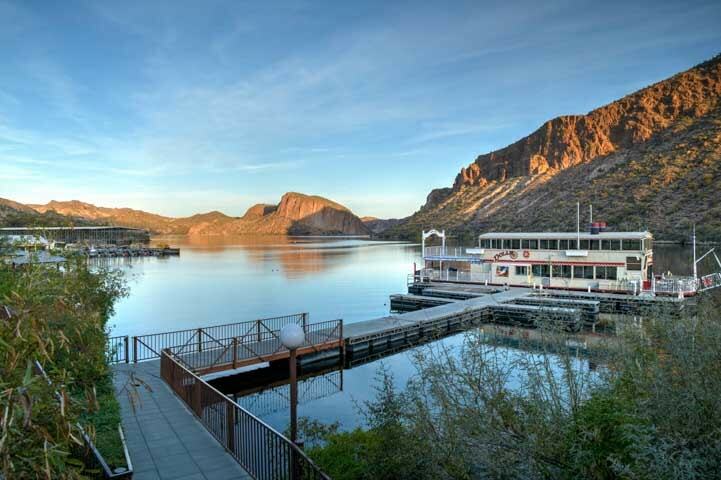 Canyon Lake is a big blue expanse of water in the middle of the desert. We talked about doing a boat ride on the Dolly Steamboat over dinner. 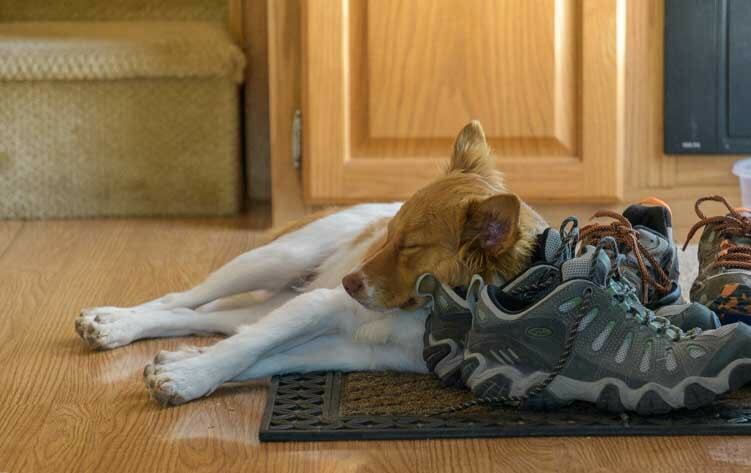 And Buddy slept on the idea too. 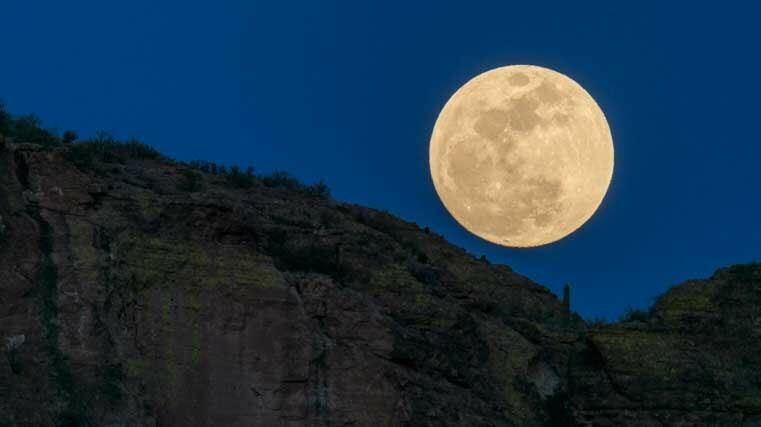 He slept right through the enormous rising full moon! 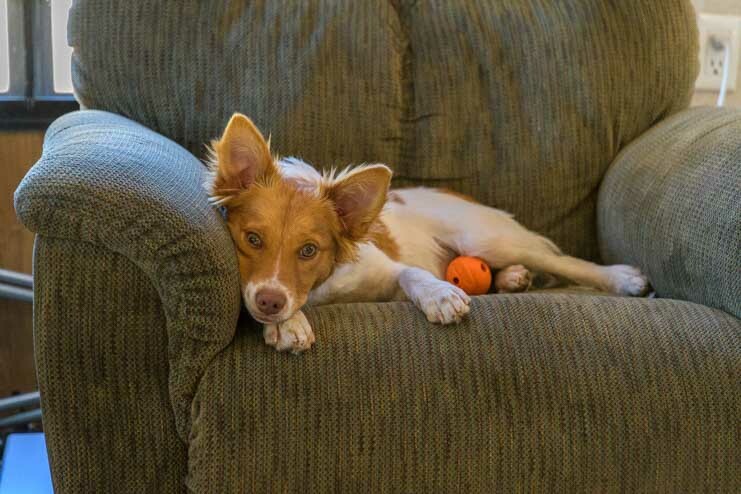 He’s a very quiet little pooch, but he does know how to express himself and let us know what he wants. The next day we went to stand in line at the Dolly Steamboat dock. A group of kids in front of us eagerly waited for Dolly to come in from her last excursion. 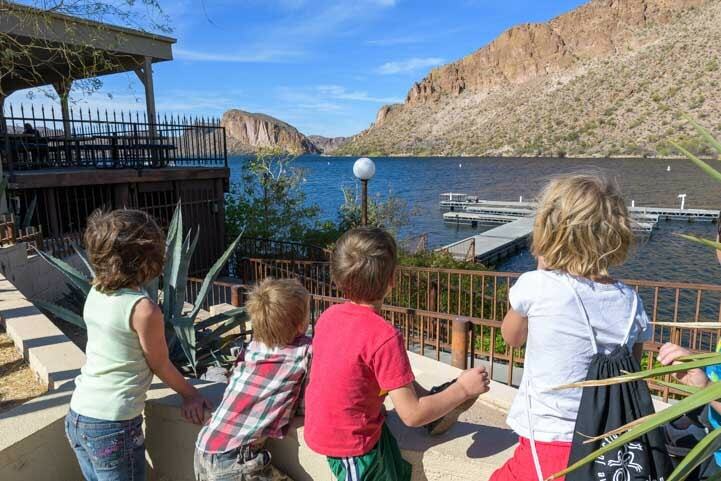 Kids wait for the Dolly Steamboat to arrive at the dock. Finally, she appeared, and we made our way down the dock and onto the boat. Mark and Buddy walk down the dock. Captain Jason was very friendly. 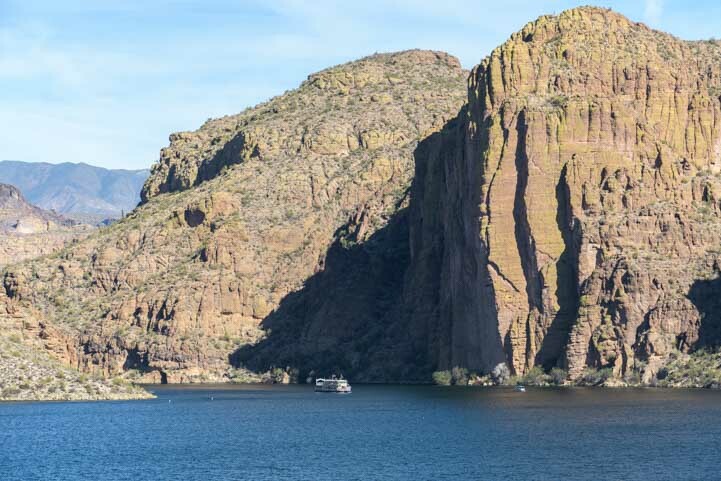 Seen from our truck window on the Apache Trail (Route 88), Canyon Lake doesn’t look all that big. 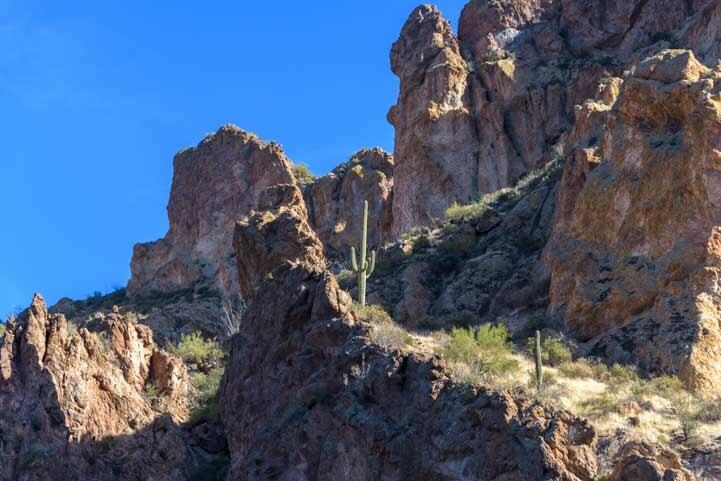 But to our surprise, we traveled three miles into the hinterlands, winding our way through fabulous rock canyons that were studded with saguaro cactus. Canyon Lake turns out to be a lot bigger than it seems from the Apache Trail. 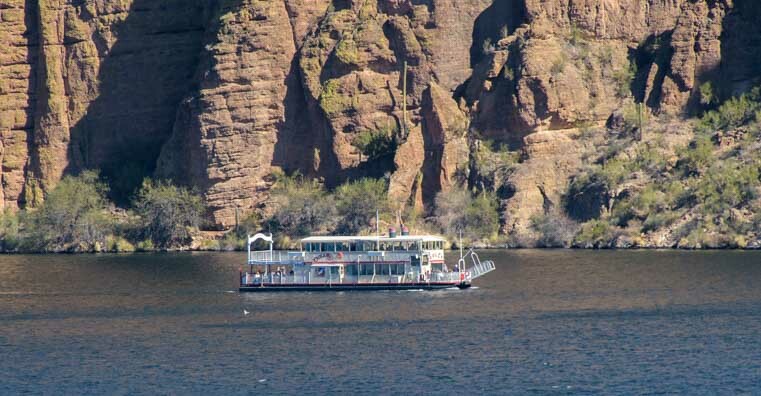 The Dolly Steamboat heads into the canyon where it will disappear from view. There is seating out on deck, and we found a seat at a table to take in the view. There are wonderful seats on the deck that offer a great view. While we marveled at the scenery, Buddy enjoyed the new smells. Buddy tests the air with his nose. We were startled at how rugged and dramatic the rock canyons were. As music by Enya played softly over the loudspeaker, we floated past exquisite desert landscapes. 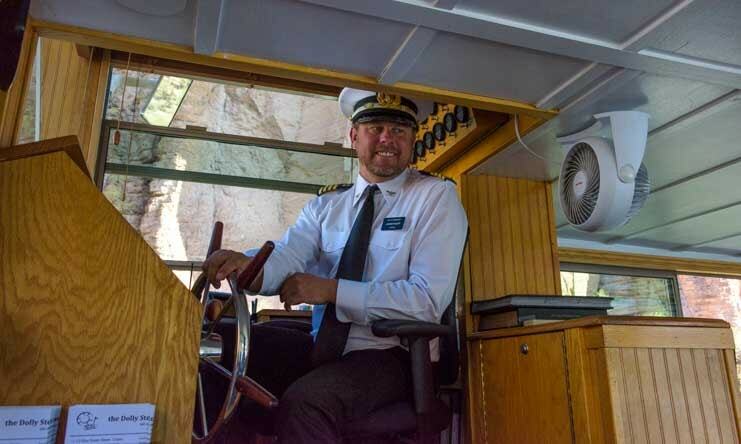 The Captain was hoping to spot some big horn sheep, which are a fairly common sighting on this tour, but the herd was somewhere else that afternoon. It didn’t matter, though, the scenery was so stunning. The rocky canyon is extremely craggy and rugged with saguaro cacti poking up all over the place. There were always more views around the next bend. 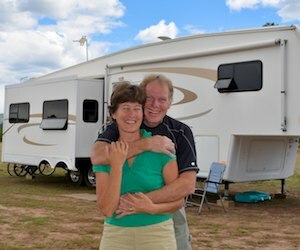 There are two free boat-in campgrounds too! 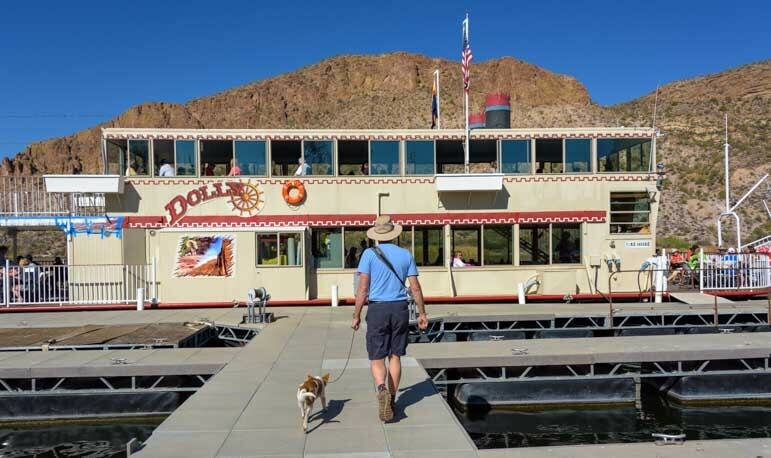 The Dolly Steamboat has indoor seating down below, as well as snacks and goodies for sale. If it’s too hot on deck, there’s a cool spot in the cabin with big picture windows. 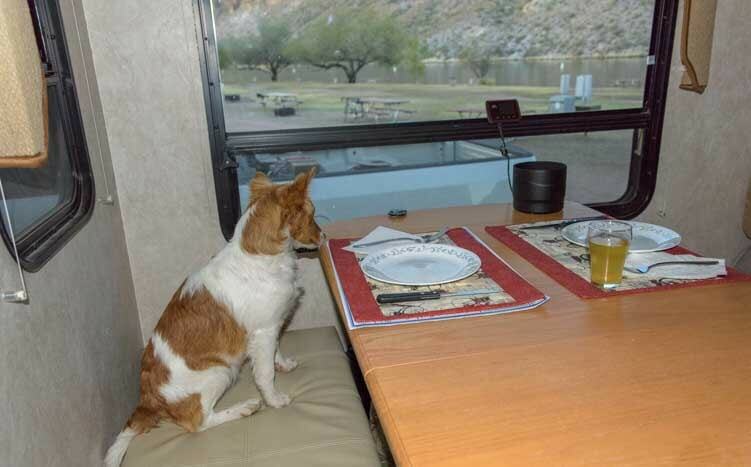 But Buddy’s favorite spot was a place in the shade up on deck where he got a dog’s eye view. Buddy found a cool spot of his own down a narrow passageway on deck. Finally, after about an hour and a half of gliding through the desert on glassy water, it was time to head back in to shore. 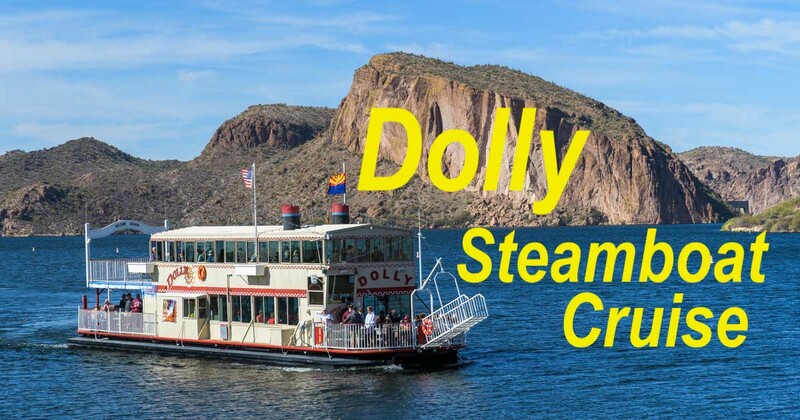 If you are traveling through the eastern side of Phoenix, Arizona, and have an afternoon or evening to spare, take a ride on the Dolly Steamboat. They have starlit dinner cruises too! 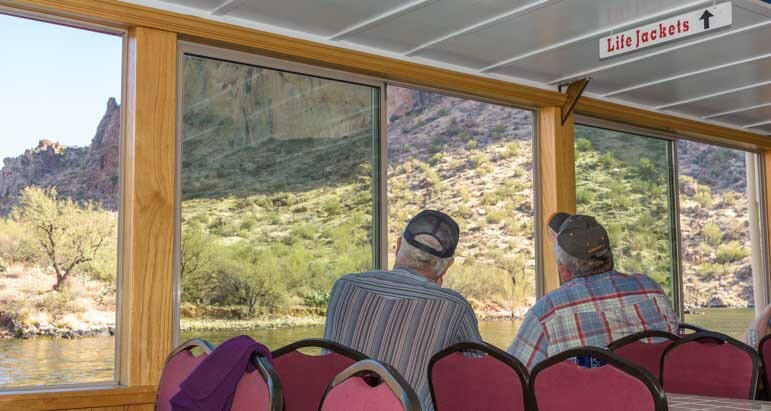 This simple little boat ride is a definite “must do” if you like the desert and want a scenic outing. 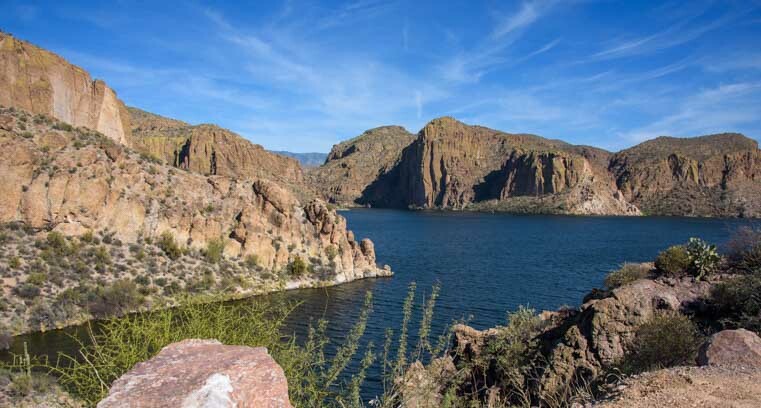 Note: The Apache Trail (Route 88 from Apache Junction to the Roosevelt Dam) is one of the most famous and popular scenic drives in central Arizona. It is full of hairpin turns and sweeping views, and there are serious drop-offs too! If taking your rig, scout with your tow vehicle or toad first. As of February 2018, the 18 mile paved portion is under construction for it’s entire length, and the winter traffic is significant, so allow plenty of time for delays — or wait until next year! 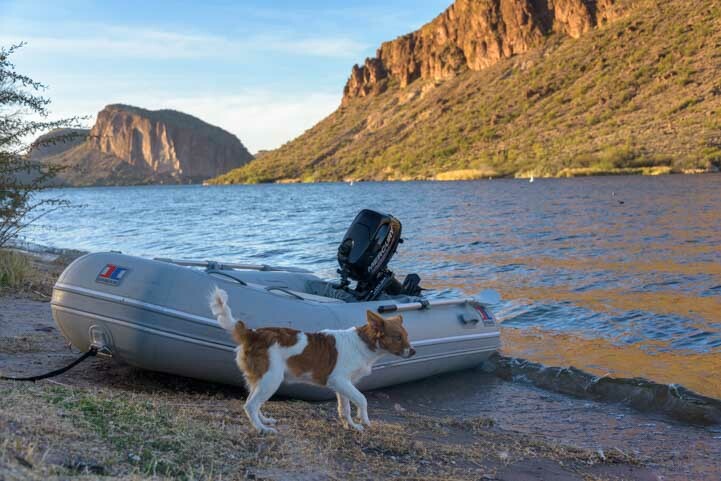 This entry was posted in Arizona and tagged Arizona, Arizona Apache Trail, Arizona Central, Arizona Phoenix East, Desert and Water, Fun Rides, New, Travel, USA, WP Travel by Roads Less Traveled. Bookmark the permalink. As I suspected, Puppy Chow is taking over the blog! 🙂 Great pics, Em. Well gosh, he’s wriggled his sweet little furry self right into the center of our lives!! Love the addition of Buddy into the posts. I could just eat him up! I really enjoyed this post. Like you said, the lake seems small but when you get down in it, it’s much bigger. The pics are really nice, as usual. I’ve added this to our “list” for Arizona! PS- Will y’all be coming back this way anytime this year? I’m so happy to know Buddy is making you smile. We could eat him up too. We’re visiting our family again this weekend, and Buddy now smells like the flowery perfume young teenage girls like to wear. He’s been getting lots of hugs and love from a whole host of beautiful young girls and he doesn’t seem to mind one bit that he now smells like a 13 year old girl. We may be in your neck of the woods late this summer. We’re still working out our plans but will definitely let you know if we head your way. Thank you for letting us know you enjoy seeing Buddy’s little mug and antics!!! Great post and informative. 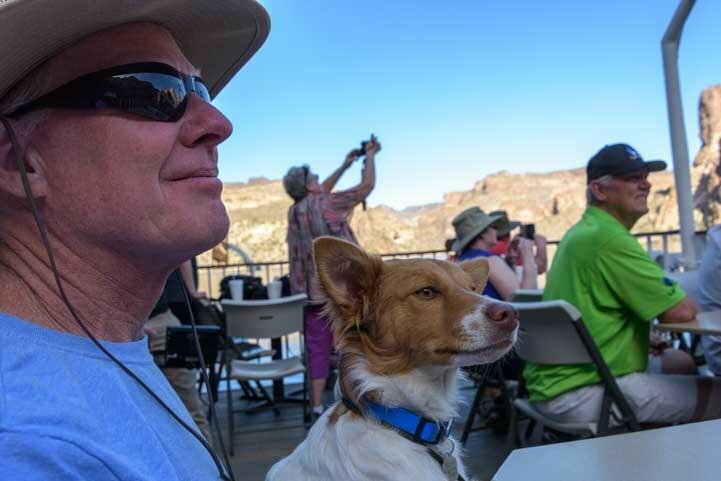 Thanks for the additional excursion idea for the area and knowing that dogs can take the river cruise is a bonus. Buddy sure looks like a good boy and seems to really be enjoying his new life. He hit the jackpot when he ended up with you. Thanks, Renee. I think we all hit the jackpot when our paths crossed, and we’re very happy to be together. 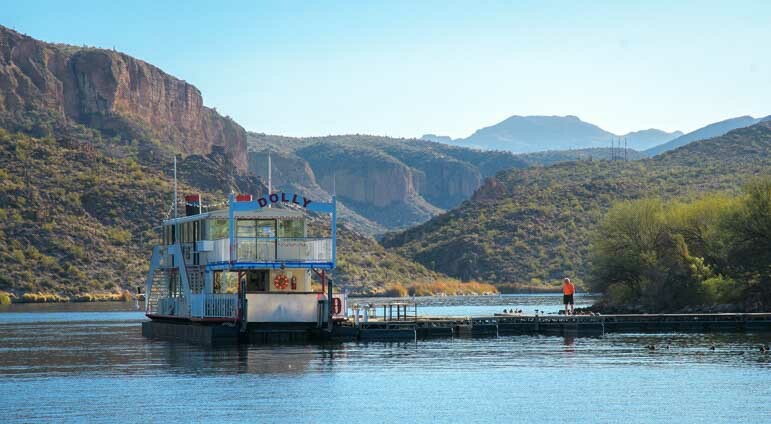 Both the Dolly and Desert Belle are lovely boating excursions on Arizona’s desert lakes. I hope you have a chance to do one or the other or both!